Read my “New Year’s Resolution: Eat Well, Get Healthy” article on the FLAVOR page of the Great Falls Tribune, Wednesday, January 6, 2010. Resolving to get healthy and lose a few pounds in the new year? You’re not alone. Great Falls registered die­titian Laura Crist said that embarking on a healthy eating plan for the new year is a common goal, but people often have unrealistic expecta­tions about how quickly they want to lose weight and improve chronic condi­tions such as high cholesterol. Many are looking for “an instant fix” or “the magic bullet” that allows them to continue their regular habits, Crist said. But the truth is that anything worthwhile takes a lot of effort. Crist recommends focusing on “real­istic, measurable goals — two or three healthy changes you can do, like adding a fruit and a vegetable at dinner, cutting down to one soda pop a day, or keeping snacks to 150 calories or less two times a day.” Having a plan is important to establish­ing good eating habits. Crist likens an eating plan to a financial budget. “The plan in place allows you to have already made some decisions about how you are going to eat before you get hungry, just like having a budget helps you decide where you are going to spend your money and how much,” she said. When we have a plan in place, it’s not difficult to eat healthy, Crist said. Eating at home gives you more con­trol and ability to follow your healthy eating plan. Those who cook their own meals from scratch at home can control the amount of fat, salt and sugar in their diets. Most people actually eat less at home, too, which helps if they are try­ing to cut calories. “Portion sizes are smaller, appetizers are often obsolete, and we often drink lower calorie beverages,” Crist explained. Starting from the top, breakfast real­ly is the most important meal of the day. It’s important to have carbohy­drates in the morning because they are the body’s favorite source of energy. Combining them with a protein or fat allows the carbohydrates to be digested more slowly, keeping blood sugar levels more stable and making us feel fuller longer. Crist suggests the following examples of ideal breakfasts that combine carbohydrates with pro­tein or fat.  fresh fruit with some cottage cheese. As for lunch, Crist recom­mends keeping it simple. Low-fat yogurt and trail mix can be healthier snacks than cookies and chips. Crist recom­mends drinking water instead of soda or juice, which helps keep calories down and makes a little room for a treat once a day. We’d be better off getting back to the basics as far as dinner is concerned, according to Crist. “More of what we tended to eat growing up — less fast food and basic meals” would be healthier, she said. Brighten your plate with steamed vegetables or a salad instead of just meat and potatoes, or finish your meal with your favorite fruit instead of dessert. Just adding a small amount of vegetables and fruits helps keep your portion sizes of meats and simple carbohydrates under con­trol. “If you can keep it fresh, your food will always taste great and be better for you,” Crist said. If meals become mundane, Crist suggests investing in a new cookbook or asking your family to help plan a week’s menu. Talk­ing with your family about healthy food choices keeps every­one on the same page, she said. In a medium heavy saucepan over medium heat, melt butter and cook onion until softened. Increase heat slightly and brown onion, stirring constantly to prevent burning. Preheat oven to broil and move rack to upper third of oven. Heat beef stock in a small microwavable pitcher in microwave for one minute to warm. Assemble soup in two small bowls or ramekins. Divide onions evenly between bowls. Top with a bread slice. Pour beef stock over bread slices. Top with cheese. Broil in pre­heated oven until cheese is lightly browned and bubbly. Makes two small bowls of soup. It can be multiplied for a larger group. Per serving: Calories 371, total fat 21.7 g, saturated fat 13.2 g, polyunsaturated fat 1 g, monoun­saturated fat 6.3 g, cholesterol 64 mg, sodium 700 mg, potassium 399.8 mg, total carbohydrates 24.6 g, dietary fiber 2 g, sugars 0.7 g, pProtein 19.7 g.
Preheat oven to 350°. In a large, heavy saucepan, melt butter and oil over medium heat. Pour buttermilk in glass pie plate or other shallow dish and soak chicken breasts briefly. Pour bread crumbs in another shallow dish. Remove chicken breasts from buttermilk and dredge in bread crumbs. Brown chicken breasts in melt­ed butter and oil until golden brown, about four minutes on a side. Turn and brown other side of chicken breasts. Arrange browned chicken breasts in a 9-by-13-inch baking pan. 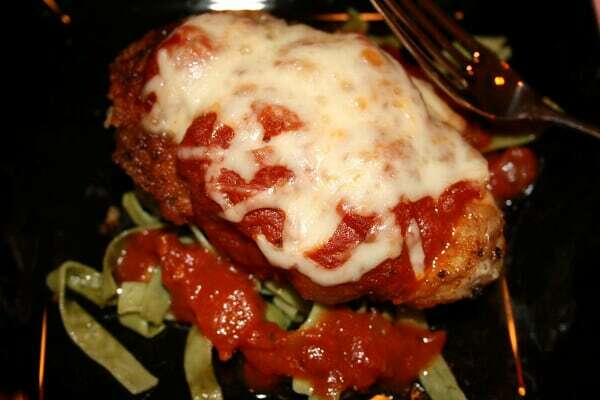 Top each chicken breast with marinara sauce to cover and grat­ed cheese. Pour additional mari­nara sauce in small saucepan and heat over medium heat. Bake in preheated oven for 20 minutes or until juices run clear. Serve Baked Chicken Italiano on a bed of cooked spinach fet­tucine with additional warmed marinara sauce. Per serving: Calories 532.2, total fat 16.9 g, saturated fat 8.5 g, polyunsaturated fat 1.7 g, monounsaturated fat 4.1 g, cho­lesterol 188.2 mg, sodium 540.8 mg, potassium 857.1 mg, total carbohydrate 25.2 g, dietary fiber 2.7 g, sugars 2.9 g, protein 66.3 g Nutritional information on recipes calculated at http://recipes.sparkpeople.com/rec ipe-calculator.asp Percent daily values are based on a 2,000-calorie diet. 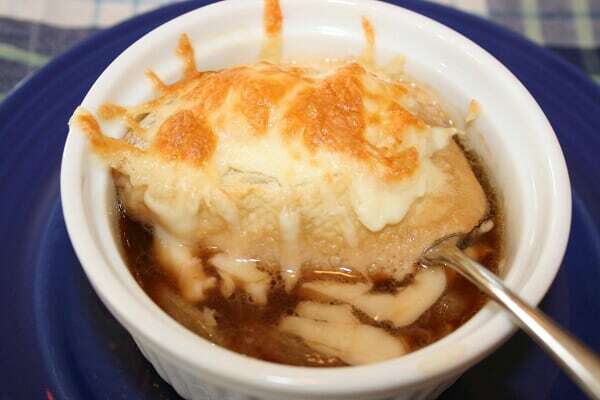 Here are an easy breakfast smoothie, a French onion soup recipe that can be assembled from a few ingredients and an Italian chicken with pasta sure to please the whole family. 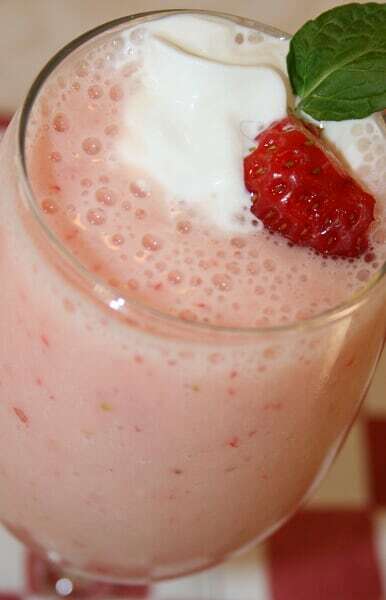 Serve in stemmed glasses with a small dollop of whipped cream and sliced strawberries, if desired.